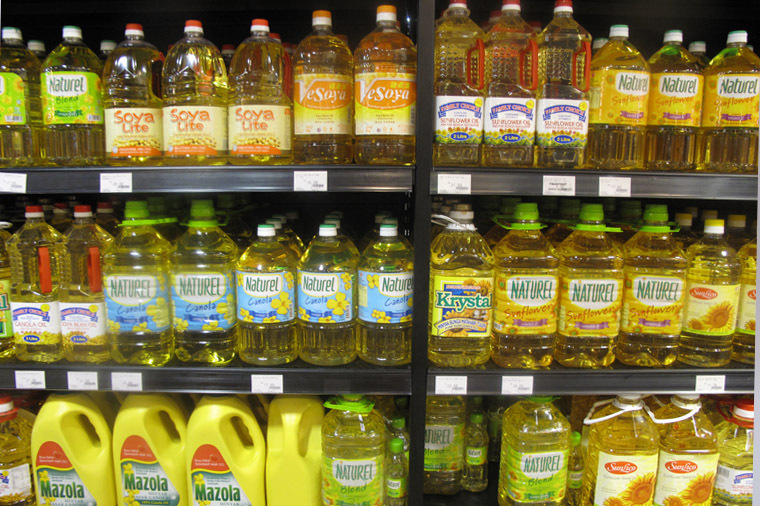 What kind of cooking oil is the healthiest & what do you normally use? Q: What kind of cooking oil is the healthiest, and what do you normally use? The healthiest cooking oil is unrefined, and contain little toxic ‘trans-fatty acid’. Monounsaturated oil is healthier. Unlike saturated fats, it does not cause cholesterol to accumulate. Mediterranean people consume abundance of olive oil (highest in monounsaturated fats), and despite eating unusually high-fat diet, they have low incidence of heart disease. However, the problem is most oil that we can find at the supermarket are usually refined (hence less nutritious), rancid and filled with toxic ‘trans-fatty acid’ due to high temperature processing. HOW TO CHOOSE GOOD COOKING OIL? Avoid polyunsaturated oils. Avoid corn, sunflower, safflower, soy, linseed/flax, and walnut oil. However, oleic sunflower and oleic safflower oil are monounsaturated – and they are more resistant to deterioration. Try to choose oleic sunflower or safflower oil. Choose monounsaturated oil as they are generally healthier than polyunsaturated oil. Olive oil and sesame oil are highly recommended. Other monounsaturated oil includes almond, avocado, apricot kernel and canola. However, these oil are nearly highly refined hence lacking in nutrient and harm omega-3 content. Unrefined canola oil is distinctly bitter, hence it’s normally refined. Its best to avoid this oil. Choose stable oil for deep frying. When frying at high temperature, choose stable oil such as clarified butter (ghee), palm, palm kernel, or coconut oil. These oil has high smoke point, hence won’t break down to generate harmful toxic fumes and free radicals when you fry your food at high temperature. Choose those labeled as ‘unrefined’. Oil that are not labeled is almost certainly refined. Unrefined oil retain their vitamin E content which helps preserves the oil from rancidity and reduce free-radical damage in the body. Unfortunately, so far, I am unable to find any unrefined oil in Malaysia. If you know of any source, please let drop me a message. In conclusion, use olive or sesame oil. I like to use these oil for light frying e.g vegetables. However, these oil are not only relatively expensive, they have a distinct taste (not neutral) and are not suitable for all dishes or deep frying. After some considerations (taking into account health benefits, suitability, price and convenience), at the moment, I choose oleic sunflower oil for regular cooking, coconut oil when I cook curry, and palm/peanut oil for deep-frying (which I personally do not do often).